A pergola provides the perfect balance between shade and sunlight, and adding one of these structures to the exterior of a home can establish a beautiful outdoor living space that’s perfect for every season of the year. Homeowners in Toms River, New Jersey, can add architectural interest to their homes by turning to SRA Home Products, the area’s premier installer of pergolas and other patio structures. We are dedicated to installing only the finest pergola products on the market, so we proudly offer items manufactured by TEMO, a trusted name in home improvement. Why Choose Our Pergolas for Your NJ Home? Flexibility – Our pergolas can be attached directly to the home, similar to a patio cover, or they can be constructed as a stand-alone option. 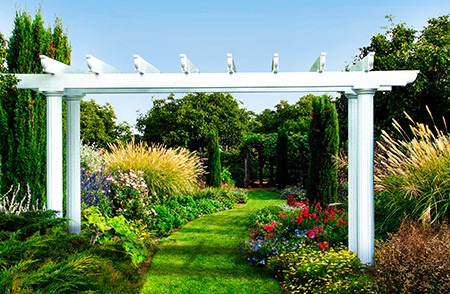 We also offer a garden arbor style with open beams that encourage climbing vines. And, if you love the look of a pergola but are concerned about having enough shade and protection from the elements, we carry an operable model that easily transitions from open louvers to a solid roof at the push of a button. Innovative design – While many NJ pergolas feature flat louvers, our pergolas come with curved louvers that offer additional shade and protection against UV exposure. Durability – Because each pergola is made of heavy-duty, extruded aluminum, there’s no need to worry about the structure ever rotting, cracking, or peeling, which are common problems with other types of pergolas. Ease of care – Thanks to their electrostatic finishes, our pergolas require little to no routine upkeep. 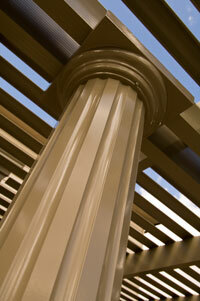 Customization – Homeowners can take their pick from three different Mediterranean-inspired column designs (Florentine, Roma, or Venetian). They can also choose the style (contemporary or classic) and the color (white or sandstone). What’s more, when homeowners trust SRA to install their pergolas, they can feel confident knowing that the project is in the hands of our highly experienced installation crews. 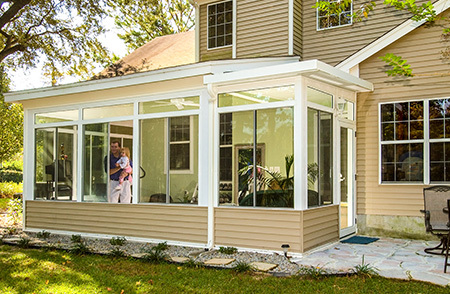 We’re a second-generation, family-owned and -operated company, and we’ve been assisting NJ homeowners with pergolas and other outdoor living products since 1988. Since our company was founded, we’ve completed more than 5,500 projects, and that experience has provided us with skills and know-how that you won’t find from other businesses in the area. Our team members are factory-trained and -certified, and have been with our company for 15+ years, on average. Our installers know how to construct pergolas quickly and effectively, and they also take every step to make our customers feel comfortable with the whole process, answering pergola questions and promptly addressing any concerns that may arise. When you turn to SRA Home Products for your new pergola, you can rest assured that you’ll be working with a company founded on small-town, family values. We place the highest priority on providing our customers with top-quality products, exceptional installations, and unparalleled customer service. Our commitment to serving our customers with honesty and integrity has even helped us earn the Better Business Bureau’s esteemed A+ rating. If you’d like to have a pergola installed on or by your home in Toms River, NJ, contact SRA Home Products today. We’d be happy to discuss the options available to you and tell you more about our installation capabilities. And, we also offer complimentary in-home consultations, so just let us know a date and time that works for you, and we’ll arrange for one of our knowledgeable team members to visit your home and take a look at the area where you’d like to have a pergola installed.